Anne Frank was born in Frankfurt, Germany in 1929. Her parents were Otto Frank and Edith Frank, and she also had an older sister named Margot. In 1933, the Frank family moved from Germany to Amsterdam, Holland to escape the Nazi regime that had recently come to power in Germany. Seven years later, in May 1940, Germany invaded and occupied Holland. Trapped once again, in July 1942 the Frank family went into hiding at Otto’s place of business. Four other people joined the Franks in the so-called “Secret Annex”: the van Pels (Hermann, Auguste, and Peter) and, somewhat later, Fritz Pfeffer. On August 4, 1944, someone betrayed the Franks and their friends to the Dutch Nazis; they were arrested and sent to the Westerbork transit camp. On September 3, 1944, the former residents of the Secret Annex were sent to Auschwitz-Birkenau. Anne and Margot were later transferred from Auschwitz-Birkenau to the Bergen-Belsen concentration camp in Germany. Both Anne and Margot died of typhus within a few days of each other, and only a few weeks before the camp’s liberation on April 15, 1945. Anne was only 15 years old. The others who had hidden in the Secret Annex perished in various camps. Only Otto Frank survived and returned to Amsterdam after the war. Anne is most recognized today for the diary she left behind. Anne received a red-plaid cloth diary for her thirteenth birthday in June 1942. She began writing in the diary shortly before her family’s arrival at the annex and charted her experience in this cramped space until their arrest (June 12, 1942- August 1, 1944, the Franks were arrested on August 4). Anne’s diary ended up being strewn across the annex floor in the midst of the chaos. Shortly after the arrest, Miep Gies, who had helped hide the Franks, made sure that the pages of Anne’s diary made it safely through the war, intending to the diary to Anne when she came back to Amsterdam. After it was realized that Anne, her sister, and her mother perished in concentration camps, Miep Gies gave the diary to Anne’s father. In reality, Anne’s diary was not one book but three separate books and 300 loose sheets of paper. Otto Frank compiled the materials into one narrative. As a father and husband of those who had perished in the Holocaust, Otto did, in fact, edit or remove aspects of Anne’s writing that he did not want the public to read. For example, he edited scenes related to Anne’s relationship with her mother (which was quite strained) as well as other entries dealing with Anne’s budding sexuality. In all likelihood, he did not want to expose his deceased family members to increased scrutiny and embarrassment. Modern critical editions of the diary now include all the material originally excluded by her father. 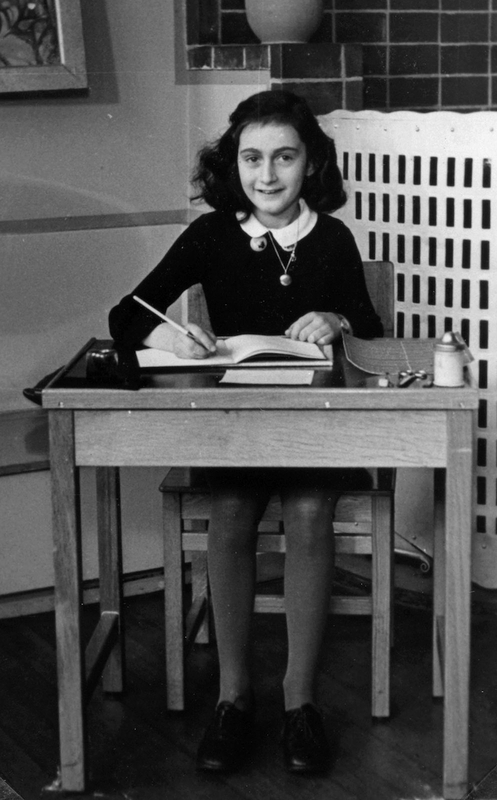 Anne Frank in 1940, while at 6 Montessori school, Niersstrraat 41-43, Amsterdam (the Netherlands). Photograph by unknown photographer. Collectie Anne Frank Stichting Amsterdam (Website Anne Frank Stichting, Amsterdam) [Public domain], via Wikimedia Commons. Anne’s diary was first published in Dutch in 1947. It was published in German and French in 1950. The first English edition was published in England and the United States in 1952. It has been since translated into over 55 languages and published around the world. Numerous plays, television programs, and films have also been written based on her diary.